Fished Potholes Wednesday. Beautiful day on the water. Spent most of the morning dialing in new gear - electronics, motors, rods and reels, and so many new bait combinations I think it will take me a year to try em all! Had a 2-3 lb. Largemouth to the boat right away then it was tough searching. Finally found a pocket in Lind Coulee with some quality walleye. There are lots of little walleye which will be great for the future but can be maddening when they are mowing through your nightcrawlers. The weather is warming nicely and the bite will improve with the warmer water temps. 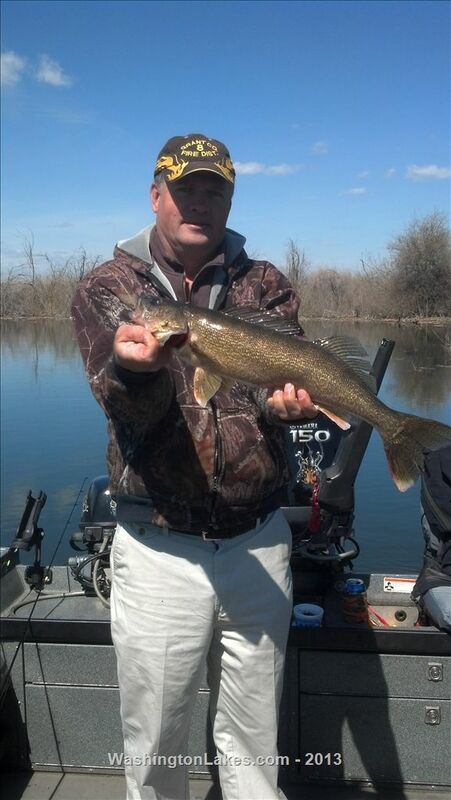 I have a few openings left for my annual spring walleye tournament prefishing special. Now through May 3 book a full day and pay for half day. This is very popular each year and is a different type of trip. Plan to hit dozens of different spots and try every technique as I "dial in" my tournament game plan for May 4-5. Also, if you have never been to a tournament weigh-in come by MarDon Resort May 4 and 5 to see some huge walleye weighed and released by some of the best walleye anglers in the northwest. Great to see you get back on the water buddy! Best of luck! thanks for the report Shelby.